a) My idea about Giger's Cabinet Door For Mia from 1979, is that he appeared to have referenced circus illustrations from the Radio Times as with a good number of his paintings since he came to England to work on Alien, and many artists who contributed to the magazine might have considered themselves serious about what they did since the magazine was quite important to British culture at the time. One illustration seemed loosely reminiscent of the other but despite this, they appeared to reference different paintings from that seemed to connect with the Henu Barque trails that I'm laying out. 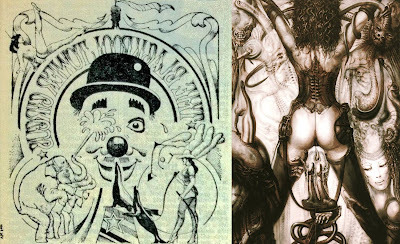 b) Cabinet Door For Mia (work 414) (1979) by HR Giger references The Blackpool Tower Circus illustration for The Radio Times for August 24th 1974? c) Cabinet Door For Mia (work 414) (1979) by HR Giger beferences Billy Smarts Children Circus illustration (for the 9 january 1978, Radio Times) by Alan Cracknell?